Thank you for joining me in Day 6. You've been working hard setting up the core framework, but after this section, it will all have been worth it. It's time to bring Flaps into his natural habitat. In this tutorial, we will create our AssetLoader object, load an animation and a bunch of textures, and use our Renderer to draw our bird and his grim city. Texture - you can think of this as an image file. We will combine many images into one Texture file to work with. TextureRegion - this is a rectangular portion of the Texture. See the image below. This image has multiple texture regions, including the background, the grass, Flaps and the skull. Animation - we can take multiple texture regions and create an Animation object to specify how to animate Flaps. Do not download the image below! It has been scaled by a factor of 4, so it will not work with the code. Instead, download the file that I provide a little further down in this lesson. Thank you to Kilobolt's artists for providing these images. // We must dispose of the texture when we are finished. Let's walk through the code a little bit. It is full of static methods and variables, meaning that we will not be creating instances of the Asset class - there will be only one copy. It has two methods: the load method and the dispose method. The load method will be called when the game starts up, and the dispose method will be called when the game is being closed. The load method begins by creating a new Texture object with the file texture.png, which I will provide below. It sets its minification and magnification filters (used when resizing to a smaller or larger image) to the enum constant: TextureFilter.Nearest. This is important because when our small pixel art is stretched to a larger size, each pixel will retain its shape rather than becoming blurry! We can use our texture to create TextureRegion objects, which require five arguments: the pertinent Texture object and the rectangular boundaries of the desired region on that Texture. This is given as x, y, width and height starting from the top left of the image, so our background image would be 0, 0, 136, 43. TextureRegions must be flipped, because libGDX assumes a Y Up coordinate system by default. We are using a Y Down coordinate system, and must flip each image (except for skullUp, which can remain upside down)! birdAnimation = new Animation(0.06f, birds); // Creates a new Animation in which each frame is 0.06 seconds long, using the above array. birdAnimation.setPlayMode(Animation.PlayMode.LOOP_PINGPONG); // Sets play mode to be ping pong, in which we will see a bounce. We gave the Animation 3 frames. It will now change frames every 0.06 seconds (down, middle, up, middle, down ...). 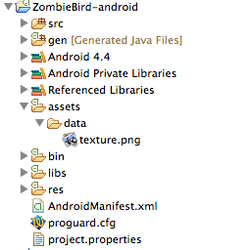 Download the provided texture file below, and place it inside the ZombieBird-android project's assets/data/ folder! This is VERY important. A note on using images: whenever you update your textures (which you will if you use your own images), you have to clean your projects on Eclipse for it to update immediately. Do that now, after downloading the file! (You can do this by clicking on Project > Clean > Clean all projects. Make sure that you have placed your image inside the correct folder as shown to the left (note we are inside the ZombieBird-android project. You can delete the libgdx.png file that is included with the project. If you are set, make sure you have cleaned your project and move on. We must also call AssetLoader.dispose() when the dispose method of our ZBGame is called by our behind-the-scenes platform-dependent code. To do this, we override the existing dispose method from ZBGame's superclass, Game. Now that all of our images are loaded, we can start rendering them inside the GameRenderer! To draw a TextureRegion, we need to create a SpriteBatch (just like we had to create a ShapeRenderer). The SpriteBatch draws images for us using the indices provided. (x, y, width and height, typically) Let's remove all the non-essential code from GameRenderer and create this SpriteBatch, as shown below. We must change our camera width to 136 and we must change the height to the game height determined by the GameScreen. To do this, we will change our constructor to ask for the gameHeight and the midPointY. // The word "this" refers to this instance. // parameters passed in from GameScreen. 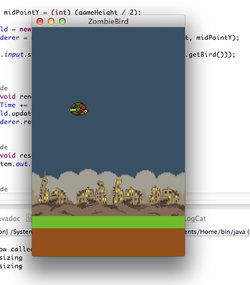 This value is needed to determine which frame the bird animation should display. The Animation object will use this value (and the previously determined frame duration) to determine which TextureRegion to display. Now that we have updated the constructor, so we must fix the errors that arise in GameScreen. We also need to create one extra variable called runTime, which will keep track of how long the game has been running for. We will pass this into the render method of the GameRenderer! - Create an instance variable called runTime and initialize it at 0. // We will move these outside of the loop for performance later. // Fill the entire screen with black, to prevent potential flickering. // The bird needs transparency, so we enable that again. // Pass in the runTime variable to get the current frame. Let's now go back to the render method and see what the logic is there. We always draw the background first, because drawing is done in layers. We begin by drawing some flat colors. We are choosing to use a color filled Shape rather than use a TextureRegion to fill the background. We draw a temporary green rectangle to show where the grass will be, and a brown one for the dirt. We then begin the SpriteBatch, again, starting by drawing the background image of the city. On top of that, we retrieve the current TextureRegion of our Animation using our runTime, and draw the bird with blending enabled. Read the comments that I have made inside the render() method! Well, that's a start! 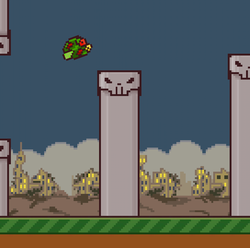 Our character Flaps flies again, and the game has started to take shape. Join me in Day 7, where we will start adding the scrollable elements of our game: the Grass and the Pipes.